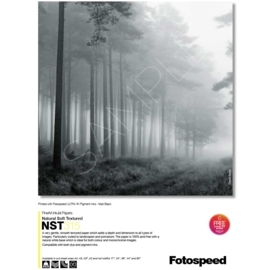 Fotospeed NATURAL SOFT TEXTURED 315gsm is a 100% natural acid free type inkjet paper with a very gentle smooth texture to the surface reminiscent of many art papers. As such, whilst this paper can add mood to many photographic images, it is also very much at home where watercolours and other paintings are to be replicated. The paper features a natural white base.